Set in a plot of 12000 sqm among the trees and endless greenery, these two magnificent luxury villas in Zakynthos (Zante) offer the ideal holiday destination for families and couples. On entering the property of Leone Luxury Villas one can immediately sence the relaxing atmosphere of the estate. Each villa covers an internal space of 300 sqm with a vast surrounding area to ensure privacy and tranquility. The whole estate is enclosed by a stone wall in an area with all kinds of trees varying from palm trees to pine trees with an endless grass area as far as the eye can see and picturesque stone footpaths and bridges. Each villa has a private swimming pool along with a childrens pool, a large sun terrace with sun beds and umbrellas. There is also a barbeque on site. The villas are spacious and comfortable. 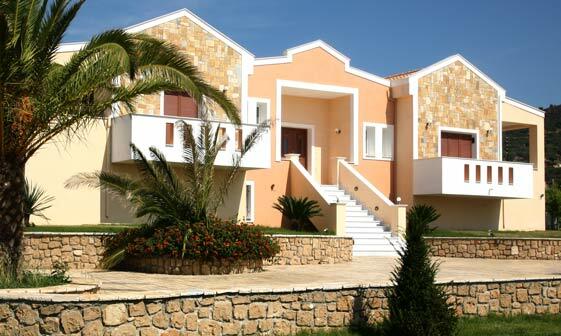 There are four large bedrooms in each villa with double beds, air conditioning and balconies off each room. Moreover, there are three bathrooms and in the main bathroom there is a hydro-massage for your private relaxing moments. There is a big kitchen fully equipped with all the necessary appliances and utensils (refrigerator, cooker, oven, microwave oven, dishwasher, toaster, kettle). You can also enjoy the large furnished living room and dining room areas where there is a large flat screen TV. An interior staircase leads to the basement where there is a vast garage with an automated door. 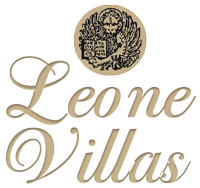 Leone Villas are safe and secure especially for children. The safeboxes and the security alarm system assure safe and carefree holidays. Catering for all your needs and offering all year round holidays, the villas are built to accommodate winter holidaymakers as well, providing central heating and a large and cozy fireplace. 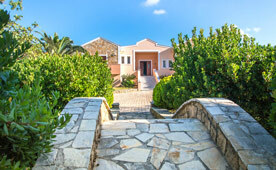 Leone Villas are situated in Kalamaki, one of the most popular holiday resorts in Zakynthos. Only a 10 minute drive from the airport and 4km from Zante town centre with restaurants, clubs, bars, shops all easily accessible on foot. Everything one might ask for is within reach at the same time allowing you to enjoy the secluded and serene atmosphere of the Leone estate. Last but not least, the villas are 500m away from the largest sandy beach of the island, where the famous turtles Caretta Caretta lay their eggs during the summer.